Wilver Dornell "Willie" Stargell (March 6, 1940 – April 9, 2001), nicknamed "Pops" in the later years of his career, was an American professional baseball player. He played his entire Major League Baseball (MLB) career (1962–1982) as the left fielder and first baseman for the Pittsburgh Pirates of the National League (NL). Over his 21-year career with the Pirates, he batted .282, with 2,232 hits, 423 doubles, 475 home runs, and 1,540 runs batted in, helping his team capture six NL East division titles, two National League pennants, and two World Series (1971, 1979). 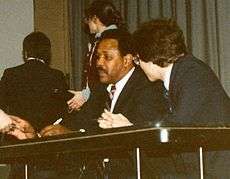 Stargell was inducted into the Baseball Hall of Fame in 1988. Stargell was born in Earlsboro, Oklahoma, but later moved to Florida with an aunt after his parents divorced. Later, he returned to Alameda, California, to live with his mother. He attended Encinal High School, where his baseball teammates included future MLB players Tommy Harper and Curt Motton. Stargell signed with the Pittsburgh Pirates organization and entered minor league baseball in 1959. Stargell played for farm teams in New Mexico, Iowa, Texas, North Carolina, and Ohio. While on the road with some of those teams, Stargell was not allowed to stay in the same accommodations as the white players. Lodging for black players was located in the poor black areas of those towns. While in Plainview, Texas, he was accosted at gunpoint by a man who threatened his life if he played in that night's game. Stargell played and nothing came of the incident. He might have quit baseball over the racial difficulties that he experienced, but he was encouraged by letters he received from friend and baseball scout Bob Zuk. Beloved in Pittsburgh for his style of play and affable manner, Stargell hit seven of the 18 balls ever hit over Forbes Field's 86-foot-high right-field stands  and several of the upper-tier home runs at its successor, Three Rivers Stadium. Though he became quickly known as Willie Stargell, his autograph suggests that he preferred his given name, Wilver. Biographer Frank Garland relates that Stargell's family and friends called him Wilver and that Dodgers broadcaster Vin Scully also made a point of using Stargell's given name. Scully said that, because he used the name Wilver, he became Stargell's mother's favorite broadcaster. Standing 6 feet 3 inches with long arms and a unique bat-handling practice of holding only the knob of the bat with his lower hand to provide extra bat extension, Stargell seemed larger than most batters. Stargell's swings seemed designed to hit home runs of Ruthian proportions. When most batters used a simple lead-weighted bat in the on-deck circle, Stargell took to warming up with a sledgehammer. While standing in the batter's box, he would windmill his bat until the pitcher started his windup. Stargell made his MLB debut at the end of the 1962 season at the age of 22. His 1963 rookie season was lackluster, but he enjoyed much more success the following season, his first as an everyday player. Stargell began and ended the season as the Pirates' everyday left-fielder, but spent extended periods playing first base, as well. He hit the first home run at Shea Stadium in the first game played in that stadium on April 17, 1964. He made his first of seven trips to the All-Star Game that year. He returned to the All-Star Game the next two seasons, hitting over 100 runs batted in (RBI) in both years, and finishing respectively 14th and 15th in MVP voting. He won the first of the three NL Player of the Month awards of his career in June 1965 (.330, 10 HR, 35 RBI). Frequent offseason conditioning problems came to a head in 1967, when Stargell showed up to spring training at a weight of 235 pounds. The team mandated that he diet to get down to a weight of 215 pounds. His batting average dropped more than .040 points that season; his home run total was reduced from 33 in 1966 to 20 in 1967. The team had a personal trainer work with Stargell before the 1968 season to get him in the best shape of his career, but Stargell had a poor season and manager Larry Shepard criticized Stargell's physique as too muscular. He finished out the decade with a strong performance in 1969 (.307, 29 HR, 92 RBI), and finished 21st in MVP voting. Stargell enjoyed another fine season in 1970, batting .264 with 31 home runs and 85 RBIs and finishing 15th in MVP voting. On August 1 of that year, Stargell collected five extra-base hits—three doubles and two home runs—in the Pirates' 20-10 victory over the Atlanta Braves at Fulton County Stadium. He became the third player, after Lou Boudreau in 1946 and Joe Adcock in 1954, to collect five extra-base hits in one game. In the same game, teammate Bob Robertson also collected five hits, including a home run; not until Andrew McCutchen and Garrett Jones in 2012 would two Pirates collect five hits in the same game. The 1970 Pirates won the National League East title for their first postseason berth since winning the 1960 World Series. They were swept in that year's NLCS by the Cincinnati Reds, but not before Stargell collected six hits in 12 at-bats, the most hits by either team in this series. Stargell's career moved to another level in 1971. At age 31, he won the first of his two home-run titles in 1971; his 48 edged out Hank Aaron's 47 on the final week of the season and, to date, trail only Ralph Kiner's 54 and 51 in 1949 and 1947, respectively, for most by a Pirate in one season. He won the final two NL Player of the Month awards of his career in April (.347, 11 HR, 27 RBI) and in June (.333, 11 HR, 36 RBI,; yet he did not win the MVP award, finishing second to Joe Torre. 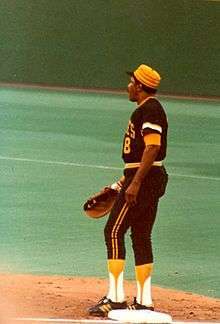 In seven of the next nine seasons, Stargell finished in the top 10 in MVP voting, as his career moved onto a Hall of Fame track. He was a member of the Pirates' World Championship team, the Pirates defeating the Baltimore Orioles in seven games. The Pirates lost the first two games of that series, which Stargell said that media began referring to as "the St. Valentine's Day Massacre" before Pittsburgh's comeback. Stargell continued to post excellent numbers in 1972 (.293, 33, 112) finishing third in MVP voting behind Johnny Bench and Billy Williams. In 1973 Stargell achieved the rare feat of simultaneously leading the league in both doubles and homers. Stargell had more than 40 of each; he was the first player to chalk up this 40-40 accomplishment since Hank Greenberg in 1940; other players have done so since (notably Albert Belle, the only 50-50 player). Stargell won his second home-run title that year, edging out three Atlanta Braves: Davey Johnson's 43, Darrell Evans' 41 and Aaron's 40. For the third year in a row, he was narrowly edged out of the MVP award, as Pete Rose took the honor. Beginning in 1975, after years of experimenting at the position, Stargell moved permanently to first base. He never played another game in the outfield. In 1977, Stargell hit his 400th career home run on June 30 against the Philadelphia Phillies. Stargell originated the practice of giving his teammates embroidered "Stargell stars" for their caps after a nice play or a good game. The practice began during the turbulent 1978 season, when the Pirates came from fourth place and 11.5 games behind in mid-August, to challenge the first-place Philadelphia Phillies for the division title. The season was scheduled to end in a dramatic, four-game showdown against the Phillies in Pittsburgh, in which the Pirates had to win all four games to claim the title. Following a Pirate sweep of the Friday-night double-header, Stargell belted a grand slam in the bottom of the first inning of the season's penultimate game to give the Pirates an early 4-1 lead, although the Pirates relinquished that lead later in the game and fell two runs short after a four-run rally in the bottom of the ninth inning, thus eliminating themselves from contention for the pennant. Stargell called that 1978 team his favorite team ever, and predicted that the Pirates would win the World Series the following year. The Pirates did win the World Series in 1979, in a similar style as they had ended the 1978 season: from last place in the NL East at the end of April, the Pirates clawed their way into a first-place battle with the Montreal Expos during the latter half of the season. They excited fans with numerous come-from-behind victories along the way (many during their final at-bat) to claim the division pennant on the last day of the season. At his urging as captain, the team adopted the Sister Sledge hit song "We Are Family" as the team anthem. Then, his play on the field inspired his teammates and earned him the MVP awards in both the NLCS and the World Series. Stargell capped off the year by hitting a dramatic home run in Baltimore during the late innings of a close Game 7 to seal a Pirates' championship. The home run was his third of the series and, coincidentally, credited Stargell with the winning runs in both game 7s of the two postseason meetings between the Pirates and the Orioles (1971 and 1979). The 1979 World Series victory also made the Pirates the only franchise in baseball history to twice recover from a three-games-to-one deficit and win a World Series (previously they had done so in 1925 against the Washington Senators). For the series, Stargell went 12-for-30; along with his three home runs, he also recorded four doubles for 25 total bases, which remains tied as a World Series record, Reggie Jackson having set it in the 1977 World Series, and his seven extra-base hits (3 HRs and 4 doubles) in the 1979 World Series also set a record. In addition to his NLCS and World Series MVP awards, Stargell finally took home the elusive MVP award (as co-winner along with St. Louis' Keith Hernandez) at the age of 39. Stargell is the only player to have won all three MVP trophies in a single year. He shared the Sports Illustrated magazine's "Sportsmen of the Year" award with NFL quarterback Terry Bradshaw, who also played at Three Rivers Stadium, for the Pittsburgh Steelers. Pirates manager Chuck Tanner said of Stargell, "Having him on your ball club is like having a diamond ring on your finger." Teammate Al Oliver once said, "If he asked us to jump off the Fort Pitt Bridge, we would ask him what kind of dive he wanted. That's how much respect we have for the man." Stargell played until 1982, but he never appeared in more than 74 games after 1979. He retired with 475 home runs despite playing much of his career at Forbes Field, whose deep left-center field distance was 457 feet. Hall of Famer Roberto Clemente estimated, perhaps generously, that Stargell hit 400 fly balls to the warning track in left and center fields during his eight seasons in the park. The short fence in right field (300 feet to the foul pole) at Forbes Field was guarded by a screen more than 20 feet high which ran from the right-field line to the 375-foot mark in right center. Three Rivers Stadium, a neutral hitter's park, boosted Stargell's power numbers. The Pirates moved into Three Rivers in mid-1970, and he hit 310 of his 475 career home runs from 1970 until his retirement, despite turning 30 in 1970. Stargell's two home run titles came in his first three years at Three Rivers. At one time, Stargell held the record for the longest home run in nearly half of the NL parks. On August 5, 1969, Stargell hit a home run off of Alan Foster that left the stadium and measured 507 feet, the longest home run ever hit at Dodger Stadium. He hit a second home run out of Dodger Stadium on May 8, 1973, against Andy Messersmith, measured 470 feet. Dodger starter Don Sutton said of Stargell, "I never saw anything like it. He doesn't just hit pitchers, he takes away their dignity." Only four other home runs have been hit out of Dodger Stadium. On June 25, 1971, Stargell hit the longest home run in Veterans Stadium history during a 14-4 Pirates win over the Philadelphia Phillies. The spot where the ball landed (the shot came in the second inning and chased starting pitcher Jim Bunning) was eventually marked with a yellow star with a black "S" inside a white circle until Stargell's 2001 death, when the white circle was painted black. The star remained in place until the stadium's 2004 demolition. In 1978, against Wayne Twitchell of the Montreal Expos, Stargell hit the only fair ball ever to reach the club deck of Olympic Stadium. The seat where the ball landed (the home run was measured at 535 feet) was replaced with a yellow seat, while the other seats in the upper deck are red. Upon the Expos departure in 2004, the seat was removed and sent to the Canadian Baseball Hall of Fame. Bob Prince, the colorful longtime Pirate radio announcer would greet a Stargell home run with the phrase "Chicken on the Hill". This referred to Stargell's ownership of a chicken restaurant in Pittsburgh's Hill District. For a time, whenever he homered, Stargell's restaurant would give away free chicken to all patrons present in the restaurant at the time of the home run, in a promotion dubbed "Chicken on the Hill with Will". Prince himself once promised free chicken to listeners if Stargell hit a home run; Stargell did homer and Prince picked up a $400 bill at the restaurant. After retirement, Stargell spent several years as a coach for the Atlanta Braves. He was the first minor-league hitting coach for Chipper Jones. He was inducted into the Baseball Hall of Fame in 1988, his first year of eligibility. He had an awkward interaction with the Pirates that season when the team wanted to schedule a Willie Stargell Night to honor his Hall of Fame election. Stargell refused to participate in the team's plans, still stinging from the team's refusal to even consider him for its managerial job that season. In the 1985 trial of alleged cocaine dealer Curtis Strong, Stargell was accused by Dale Berra and John Milner (both former Pirates teammates) of distributing "greenies" (amphetamines) to players. Berra said that he obtained amphetamines from Stargell and Bill Madlock; he said he could get them from Stargell "on any given day I asked him for one." Stargell strongly denied these charges. Commissioner Peter Ueberroth later cleared Stargell and Madlock of any wrongdoing. After years of suffering from a kidney disorder, he died of complications related to a stroke in Wilmington, North Carolina, on April 9, 2001. In his later life, Stargell had also suffered from hypertension and heart failure. A segment of Stargell's bowel was removed more than two years before he died. He had been in the hospital recovering from a gallbladder surgery at the time of his death. On April 7, 2001, two days before Stargell died, a larger-than-life statue of him was unveiled at the Pirates' new stadium, PNC Park, as part of the opening-day ceremonies. Willie Stargell's number 8 was retired by the Pittsburgh Pirates in 1982. The Pirates retired his number in 1982. In 1999, he ranked 81st on The Sporting News' list of the 100 Greatest Baseball Players, and was also nominated as a finalist for the MLB All-Century Team. He threw out the ceremonial first pitch at the 1994 Major League Baseball All-Star Game. Stargell also threw out the ceremonial last pitch at Three Rivers Stadium before the team's move after the 2000 season. After Stargell died, Joe Morgan said, "When I played, there were 600 baseball players, and 599 of them loved Willie Stargell. He's the only guy I could have said that about. He never made anybody look bad and he never said anything bad about anybody." The Willie Stargell Foundation was established to promote research and treatment for kidney disease. Champion Enterprises sponsors a Willie Stargell Memorial Awards Banquet which raises money for disadvantaged children in Pittsburgh. Stargell also worked to raise awareness of sickle cell anemia. He formed the Black Athletes Foundation (BAF) shortly after President Richard M. Nixon identified the disease as a "national health problem" in the early 1970s. For a decade, BAF, renamed the Willie Stargell Foundation, raised research money and public awareness about the disease. Starting in 1981, sickle cell awareness and fundraising was gradually being assumed by The Sickle Cell Society Inc. The Willie Stargell Foundation transitioned to raising money for treatment of and research into kidney disease. Peterson, Richard (2013). Pops: The Willie Stargell Story. Triumph Books. Stargell, Willie and Bird, Tom (1984). Willie Stargell: An Autobiography. HarperCollins. ↑ "Willie Stargell at the Baseball Hall of Fame". baseballhall.org. Retrieved 31 December 2011. ↑ Colon, Bob. "Earlsboro: Birthplace of a Legend". NewsOK. Retrieved August 24, 2013. 1 2 Pini, David. "Biography: Stargell, Wilver Dornell (Willie, Pops)". Penn State University. Retrieved August 24, 2013. 1 2 3 Garland, Frank (2013). Willie Stargell: A Life in Baseball. McFarland. p. 214. ISBN 0786465344. 1 2 3 Collier, Gene. "Obituary: Willie Stargell: Numbers couldn't measure the man". Post-Gazette. Retrieved August 24, 2013. ↑ McCollister, John (2008). The Good, the Bad, & the Ugly: Pittsburgh Pirates: Heart-Pounding, Jaw-Dropping and Gut-Wrenching Moments From Pittsburgh Pirates History. Chicago, Il: Triumph Books. p. 100. ISBN 978-1-57243-982-5. Retrieved 2016-08-07. ↑ "Telegraph Herald". Telegraph Herald. October 9, 1974. Retrieved November 7, 2013. ↑ "September 30, 1978 Philadelphia Phillies at Pittsburgh Pirates Box Score and Play by Play". Baseball-Reference.com. Retrieved 2010-01-23. ↑ "Willie Stargell Statistics". Sports Reference, LLC. Retrieved August 24, 2013. ↑ "June 25, 1971 Pittsburgh Pirates at Philadelphia Phillies Box Score and Play by Play". Baseball-Reference.com. Retrieved 2009-04-03. ↑ Mandel, Ken (2003-06-25). "Stargell's star a lasting tribute; Blast is marking point for all hitters". MLB.com. Retrieved 2009-04-03. 1 2 3 "Stargell was Pirates' inspirational leader in '70s". ESPN Classic. Retrieved November 7, 2013. ↑ Bradley, Mark. "In a time of upheaval, a constant remains — Chipper Jones". The Atlanta Journal-Constitution. Retrieved August 24, 2013. 1 2 Richard Lacayo & Joseph N. Boyce, "The Cocaine Agonies Continue" in Time, 23 September 1985. ↑ "Willie Stargell Gave Out Amphetamines, Dale Berra Testifies". Los Angeles Times. September 10, 1985. Retrieved August 24, 2013. ↑ "Stargell hospitalized, undergoing treatment". Observer–Reporter. September 2, 1999. Retrieved November 7, 2013. ↑ "Mission Statement". Willie Stargell Foundation. Retrieved August 24, 2013. ↑ "City of Champions". Kumite Classic. Retrieved August 24, 2013. ↑ Collier, Gene (April 10, 2001). "Willie Stargell: Numbers couldn't measure the man". Pittsburgh Post-Gazette. Retrieved 15 March 2014. ↑ New Pittsburgh Courier Editorial Staff. "Sickle Cell Society Inc/Murray – Irvis Genetic Disease Center: A History of Care". New Pittsburg Courier. Retrieved 15 March 2014. ↑ "The Williie Stargell Foundation Website". Retrieved 15 March 2014.